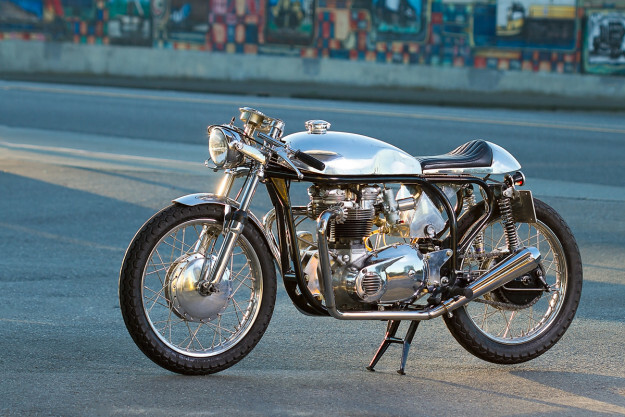 Most builds we feature start out as a ‘donor bike.’ This Triton cafe racer started out as an idea—turned into reality by a builder with the chops to execute it. 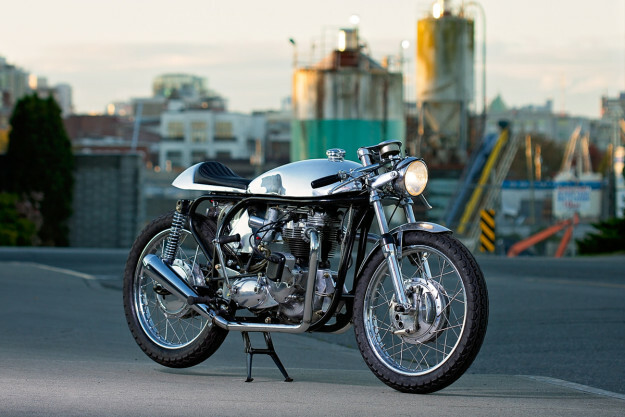 Wheelies Motorcycles is a workshop, restaurant and retail space nestled in an industrial area of Victoria, British Columbia. Joel Harrison is the guy turning wrenches—handling everything from engine rebuilds to fabrication and upholstery with supernatural skill. Joel specializes in vintage bikes. So when a customer (Mr Purnell) walked in looking for a Triton, he was in his element. 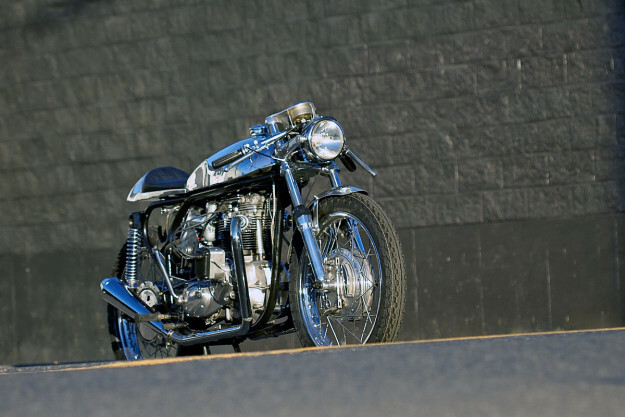 For the uninitiated: a Triton is typically a Triumph engine wedged into a Norton frame. So there’s no single donor bike. 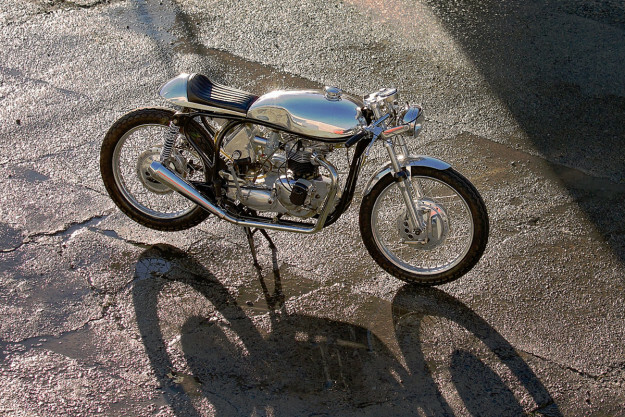 “It took about six months to find all the important parts and rebuild the engine,” says Joel. Joel pieced the engine together from parts he sourced locally, and bits he had kicking around his shop. The bottom end is from a 1967 Triumph TR6R, matched up to a 1970 Bonneville head. Extra grunt comes from an Airco 750cc big bore kit and MegaCycle cams. The top end’s been treated to Kibblewhite valves and guides, and there’s a new magneto from Joe Hunt too. 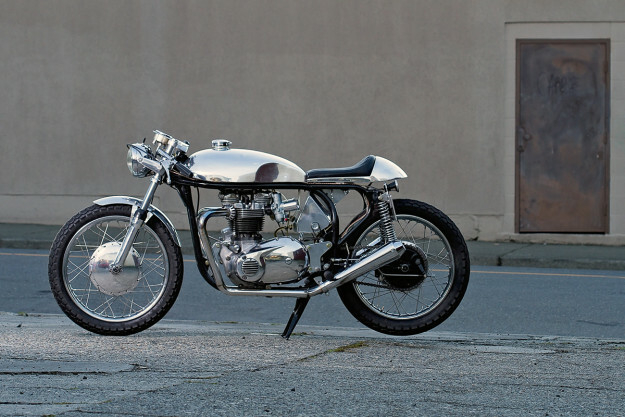 The frame’s a 1968 Norton Slimline Featherbed unit. 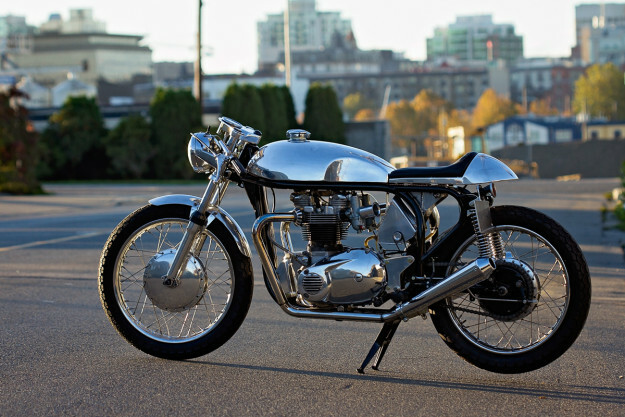 Joel sourced it from a local shop specializing in British bikes, along with a Norton Commando front end. He then set about modifying the frame—re-tabbing it, adding new engine mounts and fitting a center stand. The forks have been upgraded with progressive springs, and shortened by 1¾ inches. They’re mounted via a custom triple clamp, made “the old-fashioned way—with a grinder and files.” Out back, a set of Hagon shocks keep things in check. For the wheels, Joel laced up a new set of 19-inch rims with Dunlop rubber. The front hub is a Commando piece, equipped with a dual leading shoe drum brake, and the rear hub’s from an Atlas. Legendary Motor Parts in Florida supplied the bodywork: a Lyta-style aluminum fuel tank and oil reservoir, with a matching tail unit. Joel modded the tail section to be shorter and narrower—to better suit the tank—and added a simple, pleated leather pad. The bodywork is mounted on rubber grommets, with quick release pins making maintenance a breeze. Turning his attention to the wiring, Joel hid an AntiGravity four-cell battery in the tail unit and set about building a simple, cloth-wrapped harness. Highlights include a Sparx high output regulator and a Wassell alternator. 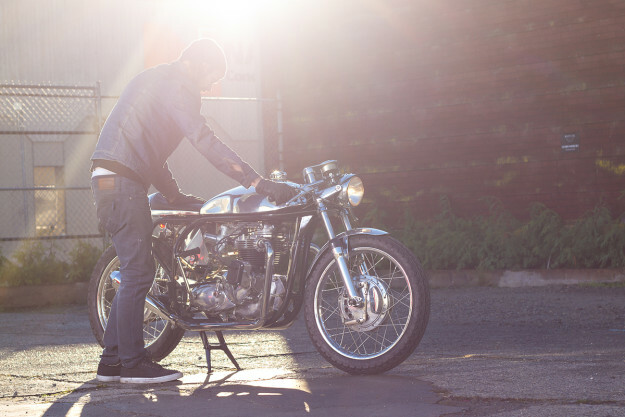 The headlight’s an original 5¾-inch Triumph item, complemented by a simple tail light and license mount arrangement at the rear. 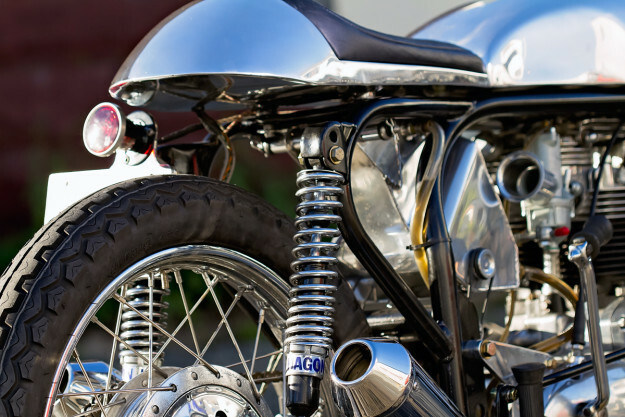 And those gorgeous sweeping exhausts are TT-style Triumph pipes, cut and welded to hug the frame’s lines and capped with simple reverse cone mufflers. The foot controls are handmade, fitted with British rubber as an added touch. And the cockpit is super-clean, with clip-ons, minimal switchgear and a single dial sunken into the hand-made triple clamp. Mr Purnell is already putting his new steed to good use—tearing up the country roads of Dawson Creek, BC. We’re jealous.